Sitting down to a good meal is a classic choice for Valentine’s Day, so why not use it as an excuse to visit some of the city’s best restaurants? Tare, one of the newer contenders on Bristol’s culinary scene, would be an impeccable choice for a date with someone who is into the foodie scene. Located on the top of the Whapping Warf development, the small restaurant offers a set 4 course British tasting menu that can be catered to vegetarians and vegans. Alternatively, if you are willing to splash a little more cash, Michelin-starred Bulrush is often considered one of the best restaurants for romantic dining in the city. The restaurant’s choice of either 8 or 9 course tasting menus would make dining there a truly memorable Valentines occasion. For those feeling that post-Christmas pinch in their wallet – or waistband – Bristol has plenty of picturesque estates to stroll through, hand in hand with your Valentine. Ashton Court, located just outside Clifton Village, is a delightful escape from the city offering not only beautiful walks amongst herds of resident deer but a gorgeous stately home and tearoom too. A little further afield, but still not far from the city centre, Blaise Castle Estate in Henbury is well worth the trip. Visitors can explore the 19th century mansion and folly castle, which is mentioned in Jane Austen’s Northanger Abbey. But if you're too distracted to take in the history, a walk around the grounds and a stop at its café alone might do the trick. Hyde & Co, The Basement, 2 Upper Byron Pl, Bristol BS8 1JY. Opening times: Tuesday - Sunday 6pm – Late. To book. Milk Thistle, Quay Head House, Colston Avenue, Bristol, BS1 1EB. Opening times: Monday - Thursday 5pm – 1am, Friday 5pm – 3am, Saturday 6pm – 3am, Closed Sunday. To book. Bristol’s Harbourside is a pretty romantic location in its own right and ambling along the water whilst taking in the scenic backdrops would be a lovely date. Yet why not make your Valentines’ day tryst that extra bit special by stopping at Under the Stars, a boat anchored near the city centre that has been transformed into bar and restaurant. Soak up the buzzing atmosphere of the nightlife around the harbour on the boat’s open top deck and watch the world go by, hopefully under the stars of a clear night’s sky. Under the Stars, The Architecture Centre, 16 Narrow Quay, Bristol BS1 4QA. Check website for winter opening times. 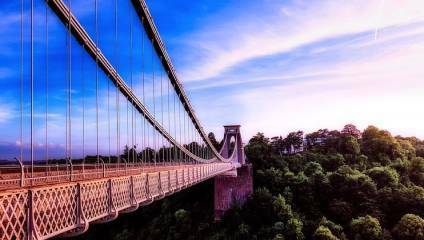 The White Lion bar boasts one of the best views in the city with its terrace overlooking the Avon Gorge and Bristol’s iconic Suspension Bridge. The terrace, belonging to Clifton’s Avon Gorge Hotel, is a beautifully romantic spot all year round, whether basking in the sunshine or cuddled up under heaters on a chilled February day and is particularly romantic enjoyed whilst the sun goes down. Relax with a drink and a plate of their delicious selection of upmarket pub classics. White Lion Bar, Avon Gorge Hotel, Sion Hill, Clifton, Bristol, BS8 4LD. Opening times: Monday - Saturday 12pm – 11pm, Sunday 12pm – 10.30pm. To book: 01179738955.